A subject I have touched upon before. We all claim to have it, but when asked tend to be a little hazy as to exactly what it is. Artists are particularly fond of it. It is after all a simple explanation as to why you painted something a particular way. Sounds better than, “I tried to get it right but I couldn’t, so I gave up and left it.” I suppose. I think probably a majority of artists would claim to operate mostly by intuition, and think it a strength. Certainly fellow artists urge me to trust it. Well I’m afraid I don’t entirely. There are two distinct parts to our thinking processes. There is the part that does 1+4 , I bet your head came up with 5 pretty quickly. There is however a part that deals with 172842 + 457913. I bet your brains weren’t so quick on that one! It isn’t just that the first was easier. You actually did no calculation at all, you just retrieved a memory. Whereas on the second you had to set to and mutter, “carry one.” under your breath. Researchers tell me that your eyes dilated and your heartbeat increased while you did the sum. Another huge difference was that the process that led to the first answer happened outside conscious control, but the operations required for second one had to be overseen by the conscious mind. 539655 that’s an erroneous total, but I knew that your unconscious mind would probably make you look down for the answer rather than bothering to calculate! One difference between the two questions is that the first is a common problem that it is worth having a permanent memory for. In the second case it would be very hard to have all the possible additions pre prepared and ready to fire. The first answer was delivered by intuition the second by calculation. We soon run into problems if we operate by intuition alone. Intuition sums up another human being in a few moments. The process as I noted before is automatic and what must be hugely complex operations are hidden from our conscious mind. In most of us the conclusions that intuition comes up with in such circumstance are given the status of a work in progress awaiting evidence. If we acted as if this intuitive summing up were true we would make many embarrassing errors in our personal relations with others. When we come up with intuitions that are not well founded we call them assumptions. We might be taken to task for “jumping to conclusions” . This and similar phrases show that we are well aware of the pitfalls of acting as if intuition is fact. Yet in painting we are urged by many to do just that. When we are urged by tutors to “let ourselves go” or “go with the flow” that is just what they are suggesting. They like to call it self expression but it is really more like partial expression. We like all animals live on the cusp between two forces. If you see a cat stalking you see the two aspects working in harness, the desperate urge to leap tethered by calculation as to the moment that the unconscious should be allowed full control. Once the charge is started then there is no time or mental space for strategy, but it is the calculating side computing the probability of success that pulls the trigger. We can jump to conclusions with drawing too. Most untrained artists when drawing a building will make a long side wall that is actually foreshortened less than they see it. Because their intuition is telling them that it is the longer wall and can’t be a mere fraction of the gable end. The eye actually sees it as a mere fraction but in the lazy mind intuition usually wins out. When drawing buildings I have actually seen people measuring and making a mark in the right place , then adjusting it to be wrong! 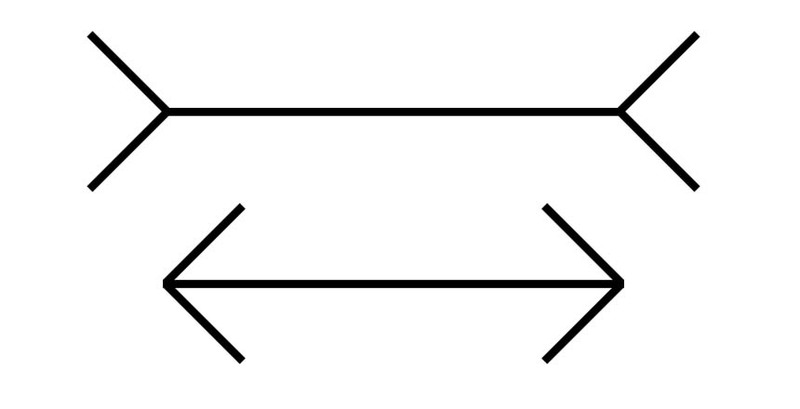 Many of you will be familiar with the Müller-Lyer illusion below. If this arrangement turned up in a scene would you really draw in the lines the same length? Even when your conscious calculating mind knows that they are the same the automatic nature of your intuitive thought constantly tells you that they are of different lengths. I don’t know how it is for you but my intuitive side wins out and I cannot help but see them as different. Many optical illusions but also many drawing errors are rooted in this effect. The unpalatable fact is that if you leave drawing to intuition alone then you will make some pretty basic errors. One I see in many artists both professional and amateur is to stretch all the verticals, often by as much as a third. This is due to the way we unconsciously assess horizontals and verticals. With tone we run into difficulties too. 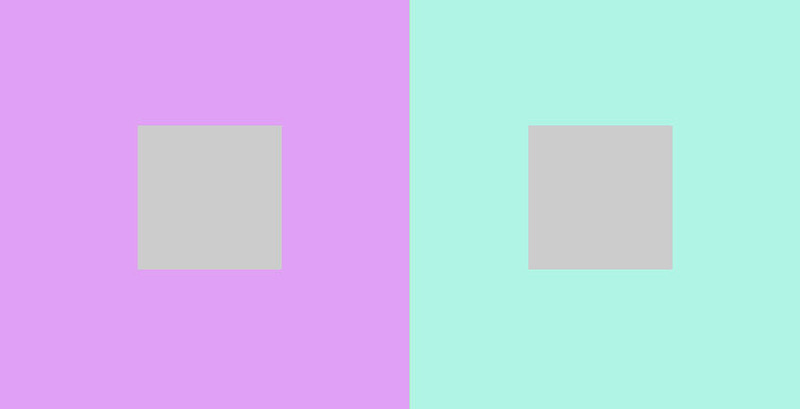 Below we see two squares that the unconscious part of us assesses as different which are actually the same. Here again the conscious part of us is no match for our intuitive side. It is no wonder that we struggle to get the tones in our paintings to reflect what we actually see. Even though we can see the tones are the same we cannot accept that the dark square in the lit area will be the same colour as one of the light squares in the shadows. I suspect that very few of us unprompted would paint them the same if actually painting this scene. To depress you further the story is no better with colour. Below is a classic demonstration of how fallible we are. 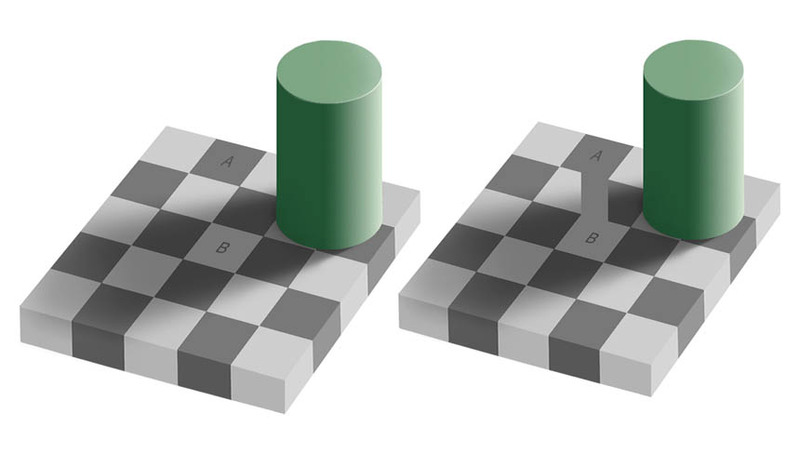 For all we are assured that the two grey squares are neutral grey, we cannot see them that way. Intuition tells us they are different even though our eyes must be reporting them as the same. Once again this often occurs in real scenes when we think we see colour where there is none. I have even seen painting tutors tell their students that they can better assess colour out of the corner of their eye in peripheral vision. Despite the proven fact that we see no colour whatsoever in that area of the eye. What will happen is that the unconscious will paint the areas without colour information with vaguely appropriate colours to supply a contiguous whole. There is nothing particularly wrong in doing this but you should be aware that the colours are supplied by your imagination not your eyes! You may be getting the feeling that I am suggesting a very cold and calculating manner of painting. Far from it, I want information from both sources. My eyes and my intuitive processing of visual information. However I want any major painting decisions to be audited by my conscious mind in order to check for unwarranted assumptions. We cannot parse every act of hand and eye, but we can learn to harness both sides in concert. One of the signs that we are doing just that is when we are “lost to the world” and totally immersed. You may assume that this is caused by intuition in full flow, but I’m afraid that the opposite is the case. It is when you are doing calculated thinking that intuitive thought is often suspended. 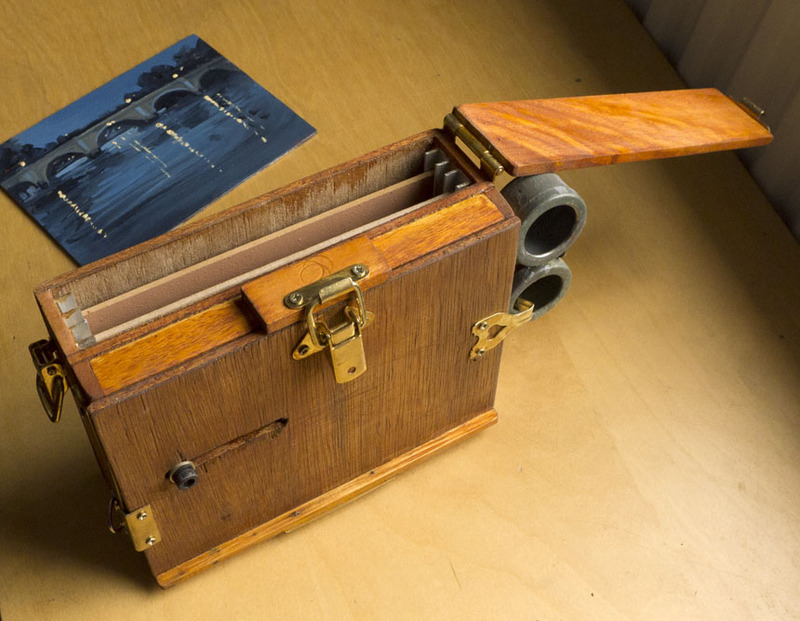 Below is a link to a video of a test of observation and counting from a famous experiment. The above may or may not work for you, but it does for quite a high proportion of people. Another thing you can do to show this is true is when you are walking with a friend ask them to calculate a sum. They will tend to stop walking (an intuitive automatic function) in order to carry out the task! So when you are painting and totally engrossed you are not as you might think using your touchy-feely instinctive Captain Kirk side, you are probably using your Mr Spock calculating abilities. It is only when you come up for air that your intuitive “How do I feel about what I have done?” part has its say. When I am painting at my best it is almost a porpoise like rhythmical activity. You dive deep into the activity and then come up for air and then dive down again. If either side gets to dominate it can cause problems. We have all had that feeling where a storm of conflicting emotions sweep through us when we are considering our own work. Also when we have become too absorbed in the process and have somehow lost the plot. Both of these attributes can be honed by practice and experience. You learn how to check for incorrect assumptions, but each time you do you hone the unconscious process and next time the “intuitive” function will be a little more on the money. This is a vital process, you cannot “oversee” all the many acts that make a painting, so you must leverage the amazing, but at the end of the day I suspect unintelligent abilities, to take as much of the strain as is appropriate. So what of emotional truth and “gut feeling” ? Well, you can as they say, “Go with your gut feeling” but the decision to do so should I think be a conscious one, not a default reaction. If any of this intrigues you at all then I can recommend Daniel Kahneman’s book Thinking Fast and Slow for further and better thought out information. I’d better stop typing and get painting or all my posts will be as dull as this one! Another period of commercial work. It’s odd I nowadays get offered jobs that I would have died for in earlier decades. Having been a freelancer all my life it is second nature to say yes to jobs when they come up. To say no so I can concentrate on my own painting is surprisingly traumatic! I am outrageously fortunate to have never run out of interesting and challenging work over nearly 35 years. Despite that there is always that nagging feeling that the work will run dry. I can quite understand why it wouldn’t suit many to not know if you have work or not in a months time. If I had had a family to bring up I suspect I would have had to take secure employment rather than living the risky existence I have done. This period of work has underlined the fact that I haven’t missed work at all. Some of the people, but not the projects or the deadlines and certainly not the meetings. The worst things were “creative” meetings or, “brainstorms”. It is an odd idea that if you stick a bunch of people in a room and get them to spew out random ideas it will generate startling artistic ideas. In my experience it never does. Art just is not democratic in that way. The film industry recognises this with its strict hierarchy, even with that I suspect many films fail because of too many opinions rather than too few. Imagine doing a painting by committee. First a discussion as to subject. Well that is likely as far as it would get. Even if there are just two painters out for a day that can double the time taken to settle on a subject! Then assuming we have our subject then the composition would have to be voted on, with no doubt plenty of thumbnails and even the odd feasibility study. The marketing manager would state the requirements for saleability and perhaps do a word picture and an image board to be put before a randomly chosen selection of the public. Then the whole thing would have to wait while a risk assessment of injury, rain or other acts of man and God would have to be carried out and a report made. Once done a scope of works could be developed. Health and safety would have to be considered, the easel checked and half the colours and the turps removed as hazards to health. Their work done the committee members could then retire to a safe distance while the picture was laid in by the painter. The painter as a manual worker would of course be the junior partner in the enterprise. The pecking order would be marketing manager, finance head, creative director, art director, producer, personal assistants to all of the above, tea maker, the framer, and finally the painter. Once the picture is blocked in a progress meeting would be held. The subject, composition, format and medium would be changed and the painter rebuked for not following the brief properly. After a quick brainstorming session the title is decided to be “Morning Symphony”. The second attempt is judged to have fallen at the same hurdles, but with the deadline looming and despair setting in the painter is told to carry on. But for God’s sake try and make it more cutting edge and contemporary! Is the Creative director’s parting plea. At last the painter is allowed to paint in peace while the committee have a late lunch during which they come up with the idea of a nocturne. Hours pass and the committee is reconvened to stand around the (hopefully) finished work. They are not pleased. Why has the artist painted a morning scene when plainly what is required is a nocturne? The marketing man rings the lawyers to check if the painter can be sued for the costs that the failure to deliver will have incurred. Painting is I’m afraid irrevocably elitist and undemocratic. You are after all supposed to be looking for exceptional achievement. You wouldn’t choose runners for your team on the Olympics on any other basis than high levels of ability. Oddly the current art establishment believes art should be democratic and skill or ability should play little of no part in the assessing of artistic worthiness. I have been woodworking again in the quest for the ideal pochade for hand holding. The results below. I have just had to accept that 7in by 5in is the most practical size. In the places I wish to paint from you often cannot stay for very long in any case. There is also the consideration of discreteness, I quite like painting in cafes and pubs, so at this size a quick sketch is more than possible. In the end I got the weight down to 1lb or 800g including panels. 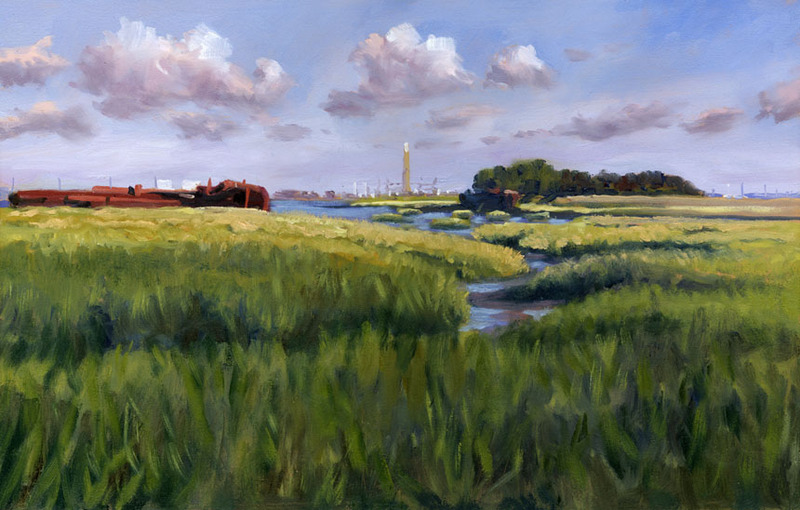 Pictures below for the plein air nerds! 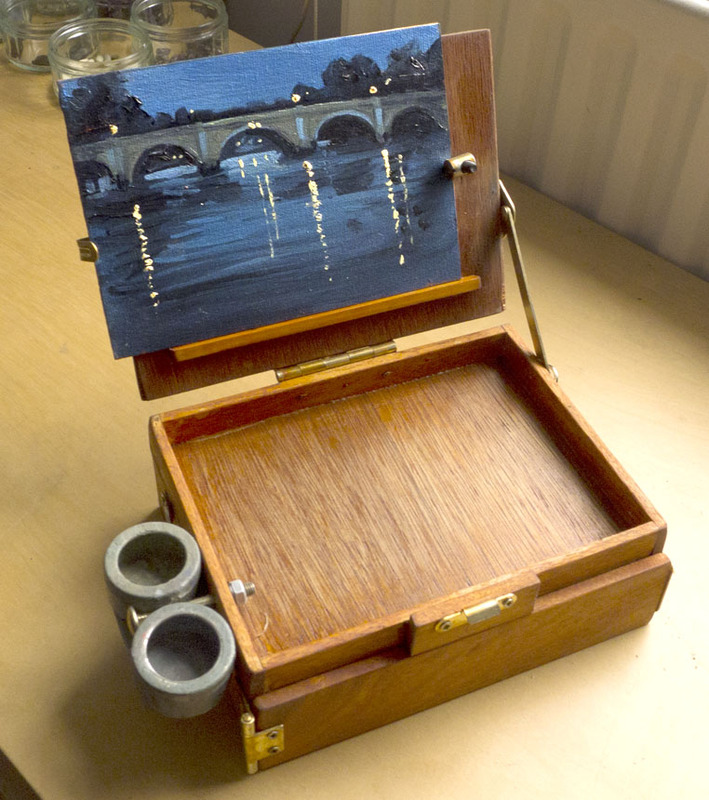 I plan to load the palette before and only carry a few key colours in a plastic pencil case. This was a visit to the Saxon shore near Gillingham with the Brass Monkeys. Wonderful day with rapidly moving clouds that changed the light from moment to moment. 16in by 10in. The same hulks from a different side. I really had to race to catch the light. When it is changing so quickly you need to fix in your memory how you wish to do the light. 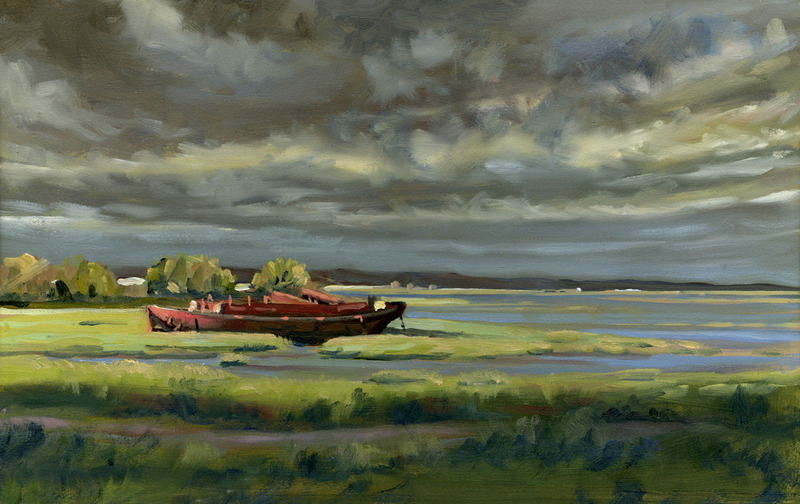 If the far shore is dark as it is here I find it best not to change it if a moment later it becomes brightly lit, chasing the light rarely works. 16in by10in. 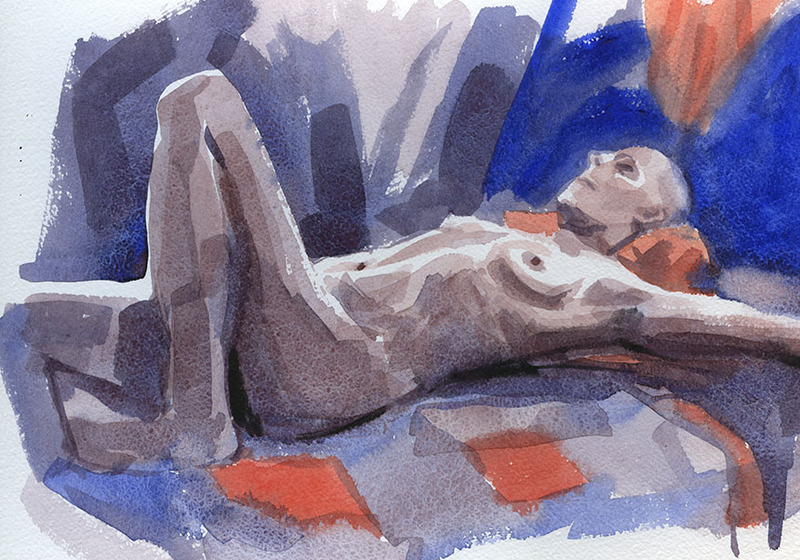 I am persisting with watercolour in life drawing. 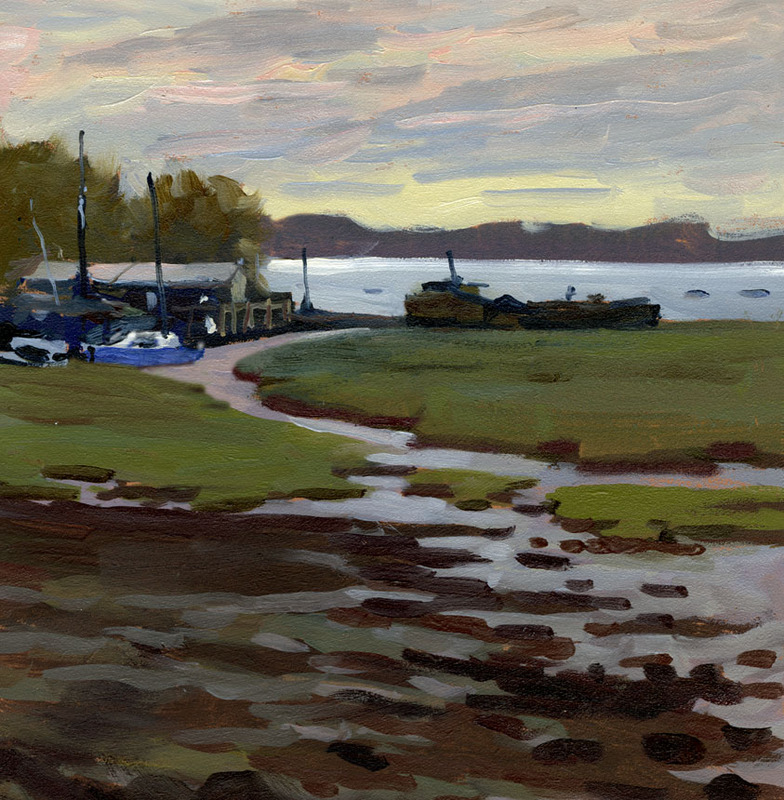 Maybe back to pastels next week, it does you good I feel to swap media every now and again. I would quite like to occasionally introduce line but I think I will have to make the tones lighter for it to work well. Here I tried to build it all up in single strokes.